A project by a student in my colleague Sara Kollbaum’s 12th grade class in Nashville, Ill. It was inspired by a story I posted last month. This is not so much a post about writing as one about a writer’s education, about one of those experiences that molds us, shapes us into storytellers. My father, Robert Hays, was the son of an alcoholic tenant farmer in rural west Tennessee. If the appellation “dirt poor” fit anyone, it fit my grandfather’s family. Daddy served in the Civilian Conservation Corps during the 30s. He and my mother, who was in the woman’s equivalent of the CCC, working as a nurse’s aide at Western State Mental Hospital in Bolivar, Tennessee, met on a blind date in early 1940 and married in September of that year. But just over a year later, Pearl Harbor happened. America was in the war. My father was among the first of those drafted in 1942. I won’t bore you with the details, but he participated in the North African, Salerno, Anzio, and southern France invasions, saved by the luck of the draw from Normandy. But they slogged through France and on to Germany. On April 29, 1945, Allied troops liberated the Dachau concentration camp. I don’t know whether he entered Dachau that day or the next, but that he was there within hours of the liberation is beyond dispute. A few months later, after more than three years overseas, he came home. In later years, he would talk occasionally about the war, providing anecdotes that showed the chaos and random chance of battle. He spoke of driving through Kasserine Pass in North Africa just hours before the Germans killed thousands of Allied troops in a stunning attack. He spoke of a friend, defending his position from a foxhole, who was thought dead after an artillery shell landed right next to him. When the dust cleared, the friend was buried up to his neck in dirt, but did not have a scratch on him. He spoke often of Anzio, where he was wounded, and of the massive German air assaults on those soldiers clinging to that tiny sliver of beach along the Italian coast. But he never spoke of Dachau. 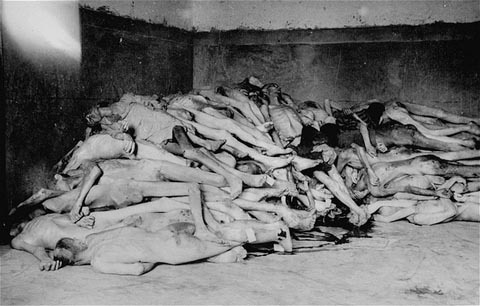 The bodies of former prisoners are piled in the crematorium mortuary in the newly liberated Dachau concentration camp. Dachau, Germany, April 29, 1945. USHMM. When he died in 1981, we found a photo in his wallet. An old sepia-toned shot like others he had taken during the war, pictures that he kept in an old brown bag. But this one was different. I was confused. Why would he keep this one photo in his wallet all of those years? Especially a photo of a place and event that he never spoke about. It obviously had some deeper meaning for him than the other photographs. If it had been a shot of the building he was in when he was wounded (hit by an artillery shell), I could have seen that. A reminder of his closest brush with death. Yeah, I could buy that. But this macabre photo? That, I couldn’t see. So, for the next fifteen years, I remained puzzled. Until the fall of 1996. I was working in Poland, and I had some time off. I took an overnight bus from Katowice, Poland to Munich. It was an interesting trip all in itself. We sat in a line of buses at midnight on the Polish/German border, waiting for our turn to cross, next to a cemetery, as if in some Cold War spy movie. I remember passing Nuremburg and thinking that my father had been there at the end of the war. And then there was Munich. I spent a day or two wandering through the streets, drinking beer in the Marienplatz. I’m a historical novelist, so the short trip out to Dachau was a no-brainer. Of course it was as much my father’s connection with it as anything else that spurred the visit. But I’m not sure that I was completely aware of that at the time. Dachau literally sits just on the outskirts of the Munich metropolitan area. I looked at the sign on the train station with a sadness, wondering for how many people that had been one of the last things they saw. It was only later that I discovered there had been another depot for those passengers. The Dachau Memorial is a place of deep emotion. In the camp proper, mostly all that are left are the foundations of the barracks. One has been reconstructed to give an idea of how horrible life must have been. The camp was originally intended to hold 6,000 inmates; when the Allies liberated Dachau in 1945, they found 30,000. The museum and exhibits are primarily in the old maintenance building. I looked with awe at life size photos of prisoners machine gunned, their hands torn to ribbons from the barbed wire they had tried to climb in a futile attempt at escape. I followed the visitors (I can’t call them tourists) north to where you crossed over into the crematorium area. It was there that the full brunt of what had taken place at Dachau really hit me. A simple brick complex, it seemed so peaceful on the fall day that I stood before it. But as I read the plaques and consulted my guidebook, as I stepped through the door and actually saw the “shower” rooms where the prisoners were gassed, as I stared into the open doors of the ovens, I felt a rage unlike any I had ever known consume me. Covering my eyes, embarrassed at the tears, I slipped back outside. It took more than a few minutes to regain my composure. I thought then that I understood why my father kept that photo close to him for so long. It was a reminder of what one group of people had done to another group of fellow humans. The obscenity of it had overwhelmed him as it had me. That night, I went to the famous Hofbrauhaus in Munich, to wash the images of the ovens away with some beer. I hadn’t been there long when an elderly American couple sat at the table. They were from Florida, a pleasant couple. He had been a young lieutenant in the American army on the push into Munich. In fact, it had been his pleasure to liberate the Hofbrauhaus from the Germans. He didn’t answer for several seconds, tears glistening in the corners of his eyes as his wife’s hand covered his and squeezed. Finally, he nodded, reached into a back pocket and pulled out his wallet. With a flick of his wrist, a photo, just as wrinkled, just as bent, as the one my father had carried landed on the table. It wasn’t the same scene, but one just like it. The difference was subtle, but in that moment, I learned two lessons invaluable to a writer, subtle differences are important, and when you want to know the truth, go to the source. As I sit here now and look at that same photograph, I realize that it was my father’s legacy to me, of Dachau. Now, nearly 70 years after that day in 1945, Dachau is still with us, and I hope the legacy left by our fathers always will be.